Imagine being in the prime of your life and wanting a child more than anything. Like many young women, Allison Flynn had plans to start a family with her husband, Dan, a few years ago when Allison was thirty years old. In her twenties, she had been a teacher, but switched careers early on and worked her way up the corporate ladder in a fortune 500 company. She says with enthusiasm that she loved every minute of it, but she was prepared to give it all up for the promise of the child she and Dan were trying to conceive. Much to the couple’s disappointment, that child was more difficult to create than they had hoped, and they were forced to seek out fertility treatments to assist in the process. 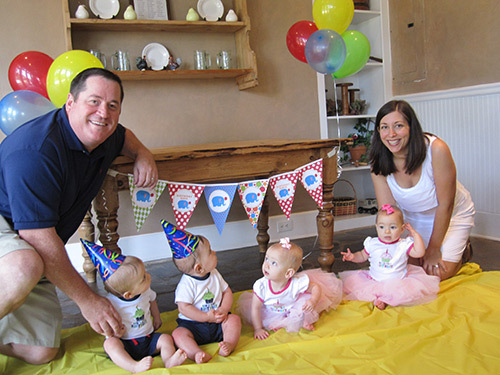 Eventually, Allison did conceive, only to be devastated a few weeks later. She remembers that moment on the table at the doctor’s office, waiting for the sound of a heartbeat that never came. After many more months of struggling, with trips to the hospital under all weather conditions to ensure Allison received the proper monitoring, the couple conceived again. This time, that joyful sound reached their ears. They had a heartbeat. But then, they heard a second heartbeat. And to their astonishment, a third, much fainter heartbeat, followed by a fourth tiny beat! Allison was thrilled, terrified, and astonished to discover that her desire for a child had multiplied itself times four. 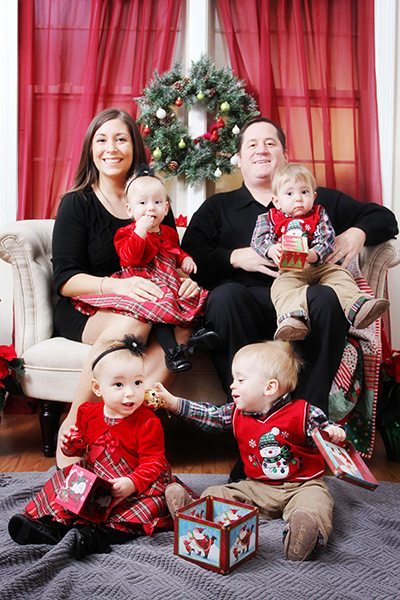 Even though the ensuing pregnancy was long and difficult at times, she and Dan now have thriving twenty-month old quadruplets, and a very busy, but rewarding life. Being a full-time stay-at-home mom is a choice she made, and she says she is happy with that decision. But Allison is a naturally driven person, and the career she left behind was a beckoning voice in the distance. She confesses, “I love my family and loved being a stay-at-home mom, but I missed doing something that was just my own.” So, when the children turned one year old, she began looking for work she could do from home so that she could not only hopefully contribute to her family financially, but do something with more adult interaction. 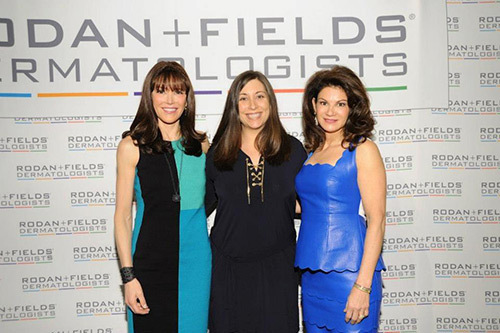 When she heard about Rodan + Fields, she was immediately interested because of the simple business model and the solid reputation of the products. She didn’t have any experience in direct sales, a fact which didn’t stop her, just as the struggle with fertility did not stop her from surpassing her expectations of motherhood. She signed on as a Rodan + Fields Consultant, and began her new career alongside her new role as a mother. She took a chance, and quickly achieved amazing results. 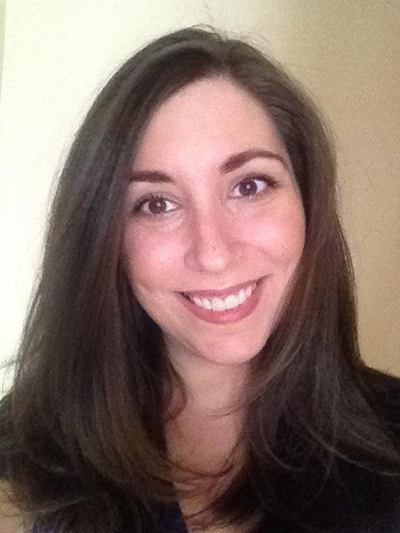 Remarkably, Allison achieved a high position as a Consultant for Rodan + Fields in a mere seven months, all the while being a very busy, full-time, stay-at-home mom. How does she do it? “Time management has played a huge role in my success in this business,” she explains. She dedicates ten hours a week to her Rodan + Fields business, and works around her kids’ schedule. “My biggest motivator is my children,” she says. Like any parent, she wants them to always be able to pursue any opportunities that come up in life, and financial stability ensures that future. She views her rather hectic life as an asset to her business, and believes that the busiest people are the ones who are the best at this business, because they are always engaged. Being active and interacting with others allows her to reach more people, and for Allison, the act of growing her team just comes as second nature. She loves talking to people, and is involved in several volunteer organizations in her community. She takes every opportunity she can to share her business with everyone she meets, and doesn’t view it as work. Thank you for sharing your story! As an aunt to triplets, and someone who struggled with infertility myself, I can relate to so much of your story. Congratulations on your success and your beautiful babies! I can relate on so many levels and truly appreciate you sharing your story! This is what its all about! Being able to contribute to my family, to myself and to help those who struggle with skin concerns find a solution that works feels amazing! I am complete! Best wishes for continued success and hugs to your beautiful babies! Thank you so much for sharing your story. I became a stay at home mom to my 3 kids after having twins and joined 2 months after my twins turned 1 because I wanted to pursue something all my own. Truly inspiring! Great story ! Thanks for sharing ! Such an amazing story Allison! Thanks for sharing! So inspiring! I am a mom of two little ones and it isn’t always easy getting everything (or at times, any one thing) done. Thank you for sharing your story and reminding me that you can do anything you set out to do. Congrats on your beautiful family and growing business! “Action cures fear” is my new motto! Thanks so much for sharing!